Well, let me be the first to say, great round up. 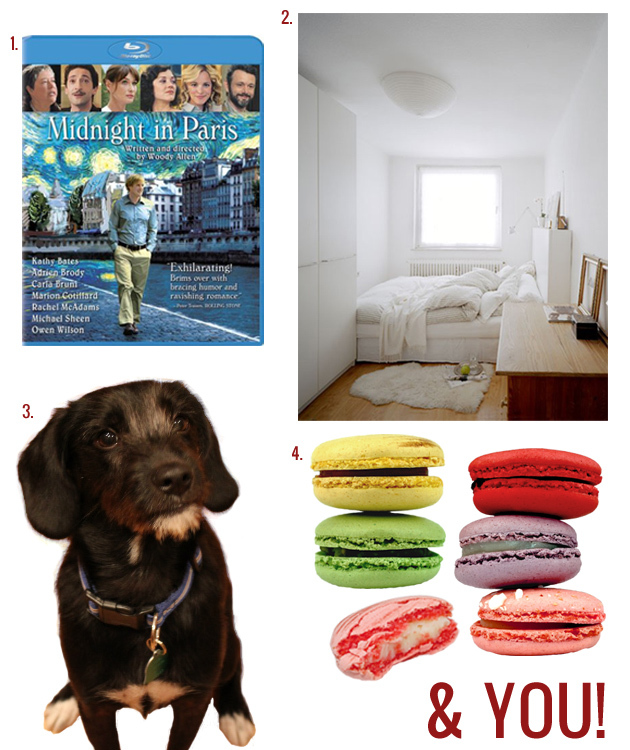 I totally need to see Midnight in Paris, along with Bill Cunningham’s documentary. The 365 Project also looks fun and interesting. Looking forward to seeing what you capture, especially with that 50mm (what a gem!). #5 is my favorite and the feeling is 100% mutual. Have the happiest New Year and, yes, I will see you next year. PS~You definitely don’t need to work on being more interesting; You’ve got that down pat. Both movies are incredible and are probably my favorite two of the year. I’ve already watched MIP 3 times, and I’m planning on buying the Bill Cunningham documentary soon with some leftover holiday money. Can’t recommend either of them enough! I had fun tweeting with you on NYE! Hope your midnight celebrations rolled around without too much insanity :) I can’t wait to see what you come up with in 2012! I’m so happy to have you along for the ride. I’m so envious of your NYE. We’re hosting part one of a three part progressive tapas and drinks in the neighborhood. Sounds fun, but I’m worn.out. At least we’re first, so we can sneak out early. I can’t believe I haven’t seen Midnight in Paris either. Want. I have been toying with a 365, but right now I’m leaning to a Project 52…perhaps I have commitment issues? And enjoy your 50mm…it’s one of my favorite lenses! I love the idea of the 3 different tapas-and-drinks stops in the neighborhood! Though I don’t know my neighbors here, so I’m not sure that would be as fun. You have to tell me (and the rest of the blog world) about your NYE festivities. Did you manage to stay up til midnight? You know I’d end up dragging you both to Laduree, right? Haha. I’m definitely going to take you & Ben up on that offer! Hope your Australian NYE was a blast, lovely. You forgot to tell me about the 50mm!!! How is that possible? Fitz may be turning 1 but he still has a lot of 5 month old in him! Ohh man, the lens is amazing. I’ll have to give you the 50mm lens I had for the Nikon. You’ll fall absolutely in love with it. I think you’re being generous with “5 months” for Fitz. I’m going with 2. Ah bless you Erin, I could have guessed those five things and I’ve only known you a few months! I really need to see Midnight in Paris. Last night I saw Sherlock Holmes and it was the funniest film since Bridesmaids (actually it’s the first time I’ve been to the cinema since Bridesmaids). You must go see but perhaps that’s too low brow for a macaroon eating Parisien art lover like yourself? I’m very interested in the 365 project. I might do that too. Are you going to post it on your blog or do it separately? I forget we’ve only known each other the past few months! Feels, nicely, like it’s been a lot longer. I’m delighted you were able to figure those 5 out, too. I’m going to be posting the 365 project to a separate part of the blog (which was a full-day undertaking, trying to set up), and I’m really excited about it! You should totally do it, too! We can be mutual support so neither of us can slack off! Well haven’t I missed the deadline by not starting yesterday? No not necessary to see the first one but I think you will enjoy it more if you have seen it. There’s a really cool homage to Heath Ledger inBatman in it. RDJ is awesome he’s so funny. And hot. Gonna check if MIP is out here on iTunes…. Well, yes, technically the deadline was yesterday but considering this year is a leap year, if you were to start today you could still have 365 photos (thank you, February 29th!) for the year. You should do it!! I’ll try to watch Sherlock Holmes and then check out the second one. I saw two movies in two days this weekend and I realized how much I missed going to the theater. So hopefully I can keep the streak going and see more. It’s just so expensive these days. $11 for a ticket. For shame.